Some news from South Sudan following the visit of the one of the brothers. Yambio is the capital of the state of Western Equatoria, in the south of the country, in the forest that extends to the Congo and Central African Republic. A priest that I met told me: "In our region we have accumulated ordeals: there was the war and then the atrocities of the Lord ’s Resistance Army. Many are still traumatised and unwilling to return to their villages. There are many young people, ready to get to work. We need to train them and develop their potential. But 80% of young people have no formal schooling and are not working. What do we do for the next twenty years, to give them a purpose in life?" Rumbek is the heart of Dinka country. The door is always open to the single room where Father Colombo, administrator of the diocese, lives and works. After the first few minutes, when a huge tiredness seems to take him over, his speech suddenly comes alive and his passion for the mission breaks through. 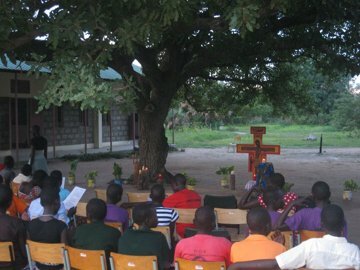 He explains: "Just for the parish of Rumbek we would need to open twenty chapels. The pastoral needs are immense. There is also the formation of seminarians. I’m been in Africa for decades, but this is the hardest and the poorest place I’ve been." John Mathiang is one of the three Dinka priests of the Diocese of Rumbek. He has helped start a primary school which welcomes, in addition to the village children, those repatriated from the north who need to be reintegrated. "Only two teacher teachers are supported by the Ministry of Education", he tells me. "For the others I have appealed to young graduates who teach on a voluntary basis. Thanks to the assistance provided by Operation Hope, we’ve been able to build a room for storing food and preparing the morning porridge for the children. It’s a strong motivation for them to come to class regularly. At home they often only have one meal a day. 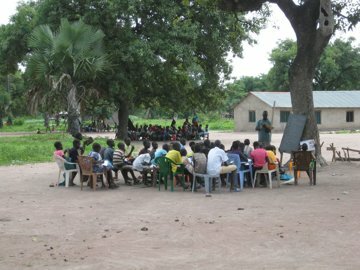 In addition, we are still build permanent classrooms for the pupils who are still learning under the shea trees. Nearly one million refugees from the civil war have returned to South Sudan since it became independent two years ago. They came up the Nile by barge and were then transported by truck. Natives of the region, most have never actually lived there, though. They were born in the north, in the camps around Khartoum. They speak Dinka quite poorly and have not been immersed in traditional society. "We’ll have to integrate them gradually, but the children are already at the primary school," says John Mathiang. Everywhere young people express their desire for training and study and their willingness to get down to work if someone will give it to them. The establishment of networks and development plans is a matter of a few years. The needs are such that there will be work for everyone. NGOs, UN agencies, religious institutions, and even local government offer strategies, resources, generous and skilled personnel. It is remarkable that many of these young people are aware of the need to deepen a personal foundation in order to build their lives and serve their community and their country. They sense that faith and communion with Christ is essential if they want to firmly and sustainably put down roots. They find that looking at a bible text, prayerful listening are ways in which God can enlighten us and dwell in us. Coaching, a shared experience will encourage them and confirm them. * Estimated population: nearly 12 million. * Life expectancy: 42 years.